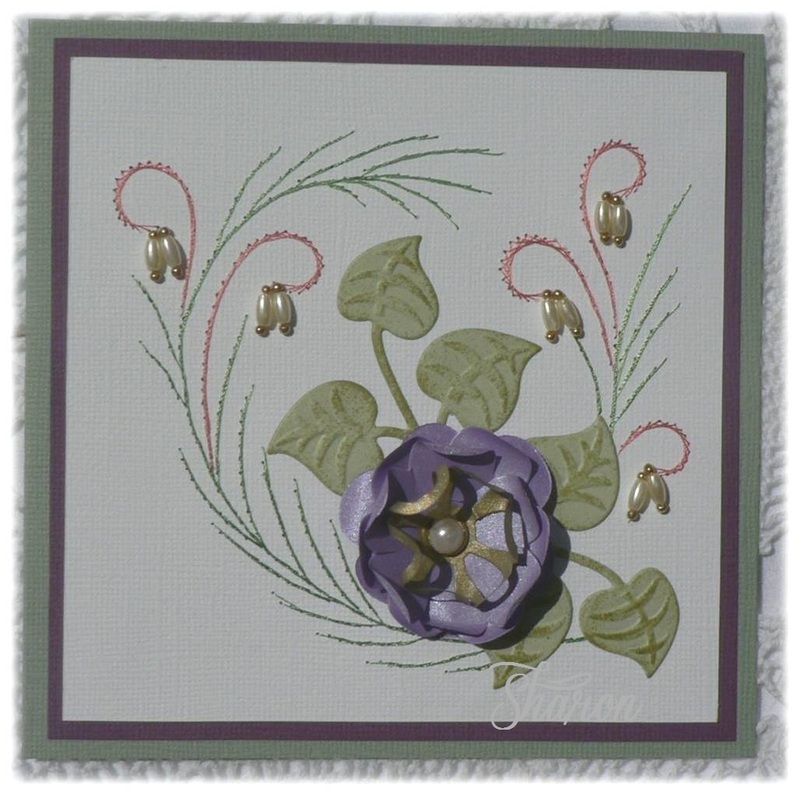 Last new patterns from Ann's Paper Art for 2012. This pattern number is a669 and is available now in the webshop. I think that this pattern can be used for many different occasions. The threads used are Mettler Polysheen, 1913, 853, 170, 821, 5934. The decoupage is by Marieke's Design 2618, I think that she is ever so cute. 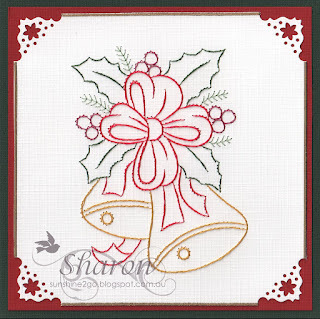 Dies used are Nellie Snellen Shape Dies SD004, Marianne Creatables LR0224 and Joy Craft 6002/0136. Hobby dots have been placed in the centre of the flowers which were coloured on the edge using Tim Holtz Distress Ink, Aged Mahogany. 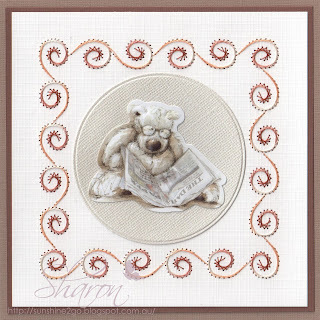 This card was stitched using pattern a670 and is also available from the webshop. The threads used are Mettler Polysheen, 2155, 3761, 3641, 2057. 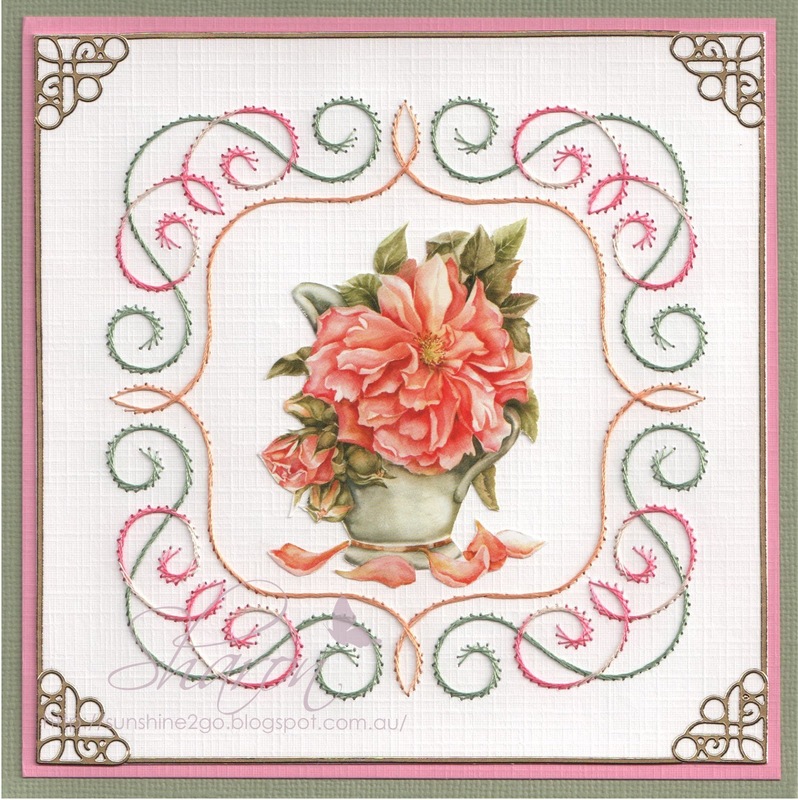 A sweet little Morehead die cut decoupage 11052-372 has been placed in the centre of a Nellie Snellen Multi Frame, MFD048. Hobbydots have been placed on the die and around the edge of the card. 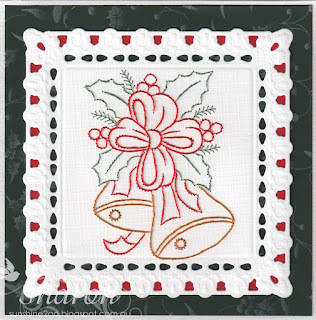 I look forward to seeing what new patterns Ann comes up with in 2013. Christmas is getting closer and I have been very busy making some cards. This is a new pattern for 2012 from Ann's Paper Art. The pattern number is a666. Threads used are Mettler Polysheen 0622,1903, 3971,3953,3641. Nellie Snellen MFD028 makes a lovely edge along the bottom of the card, I have also added a few small jewels along the bottom of the die. Red hobbydot line stickers have been added along the edge. 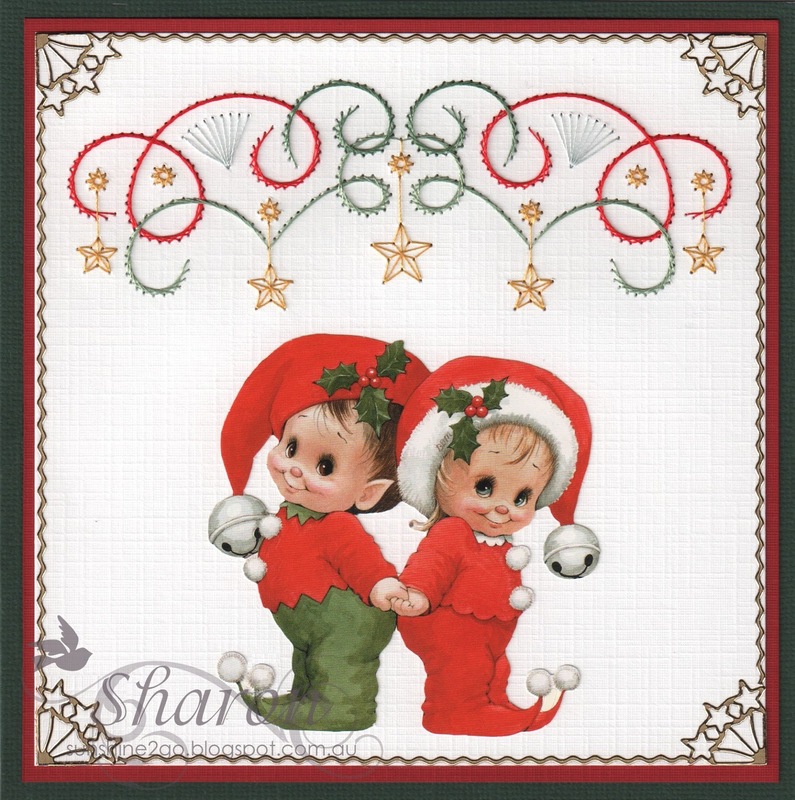 This is also a new pattern for 2012 from Ann's Paper Art. The pattern number is a667. Threads used are Mettler Polysheen, 3761, 0622, 3651, 3541. 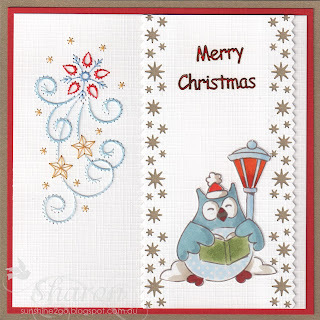 Here you also see that I have used the gorgeous Elaine's Christmas Owls #2 once again, although this time I have placed the decoupage on a strip which has been edged with the Martha Stewart Stars Edger punch. Merry Christmas sticker is from Starform. Ann has a new Challenge pattern #a103, I am entering this card in the Challenge Blog. I have used a cute little Sarah Kay decoupage, I thought that she looked quite at home with the butterflies. Every-one that enters can pick a free pattern from Ann's Paper Art Webshop. This card will remain at the top of my blog till the Challenge is complete. Once again I have used a new free pattern from Ann's Paper Art a103. This time I have changed the stitching a little and I am so happy with the end result. I have gone for a blue theme. The threads used are Mettler Polysheen, 3641, 3963, 3951,3971, 824, 3953. 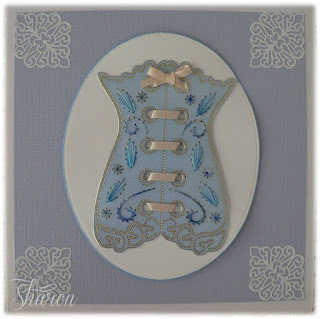 Spellbinders have a wonderful new die called Fancy Ribbon Threader which I have gentle chalked around the edge in a light blue. I cut a thin piece of blue bazzil and weaved to look like ribbon. A cute little Sarah Kay decoupage has been added to the centre. I punched out 2 flowers with the Nellie Snellen Floral punch which I also chalked around the edges and the middle and combined amongst the stitching. 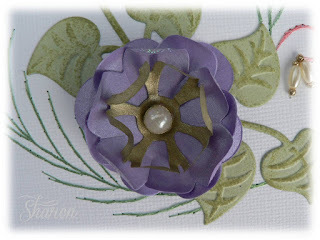 Don't forget to go to Ann's Paper Art to get your free pattern and enter the Challenge Blog. 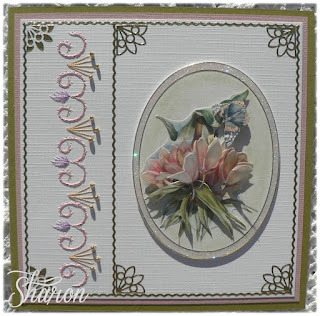 I have entered this card on Ann's Paper Art Forum. Once again with a new pattern from Ann's Paper Art the pattern is a665, this is the second Christmas card I have created with this beautiful pattern. 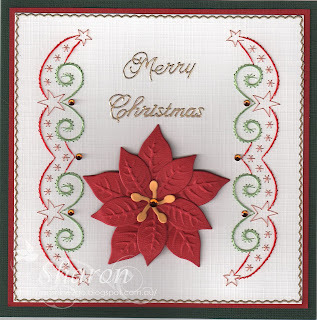 I have used untraditional Christmas colours for this card and I love the end result. The threads used are Mettler Polysheen 3953, 3641, 1902, 3951, 3971. I have used red seed beads and blue rice beads. 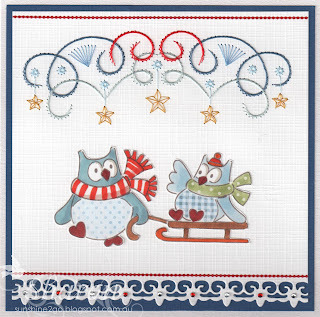 The cute decoupage is a new Christmas one, Eline's Christmas Owls #2. Silver Christmas Starform peel off stickers #980 have been used in the corners and along the edge. I would like to enter this card in the challenge at Fadengrafik Challenge Blog. A new Christmas pattern from Ann's Paper Art for 2012. The pattern number is a730, this is a wonderful pattern, and I really enjoy stitching it. I have resized the pattern to fit on the Marianne Creatable LRO234. The threads used are Mettler Polysheen, 824, 1902, 5743. 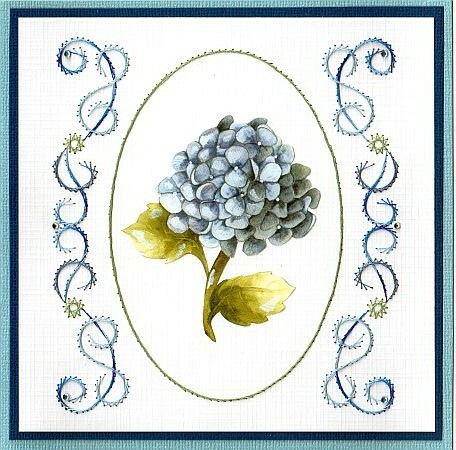 The pattern number for this card is a665 I really enjoyed stitching this one also. 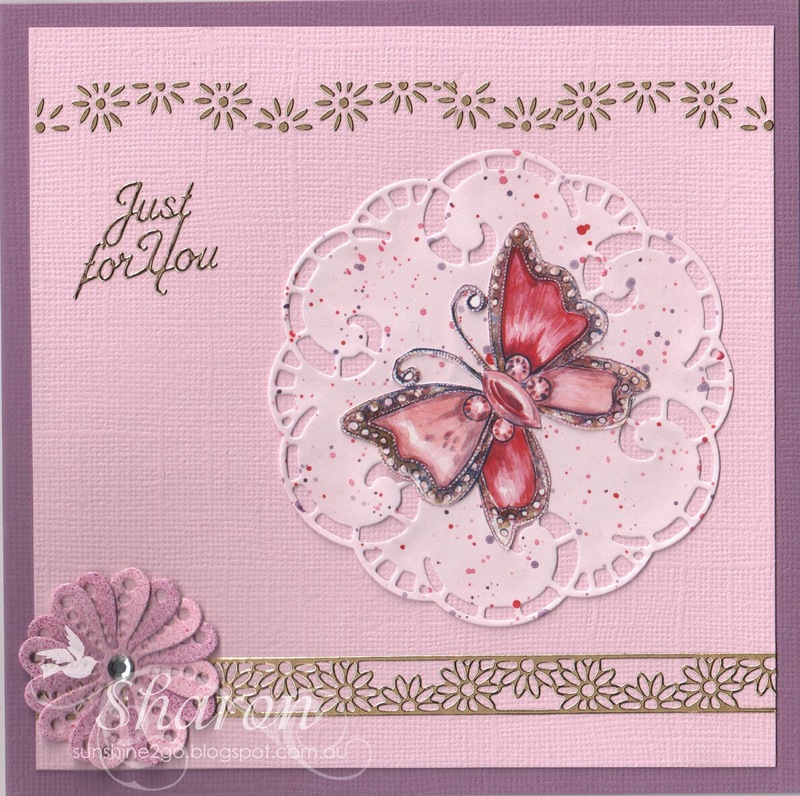 I have used a couture creation circle die in the centre with a lovely decoupage by Weabko #831. The threads used are Mettler Polysheen, 2905, 315, 5822, 2910. Hobbdots gold stickers have been placed around the edge of the card. Gold jewels have been used in place of beads. This week at Cardmaking Online I have created this lovely card using a Victorian Square die by Couture Creations. 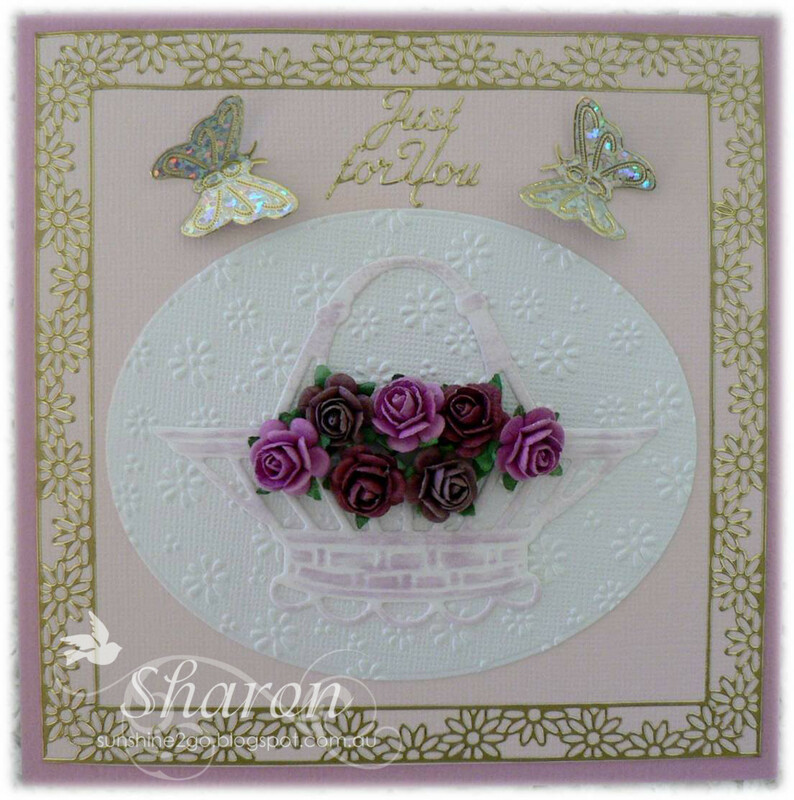 To see how to make this card go to Cardmaking Online Blog all products are available from the webshop. This is my contribution to the blog chellange. Come and join the fun at Ann's Paper Art Blog, the theme is to make a card or project using the free stitching pattern, which is available as a download from Ann's Paper Art Blog. The wonderful prize is a PRECUT and hand embossed set. 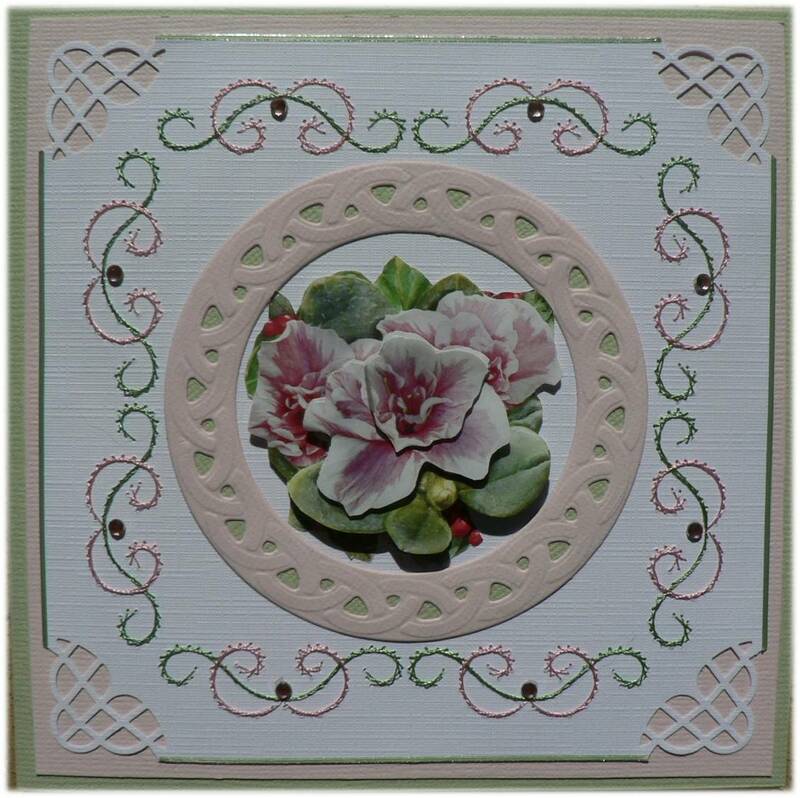 All products are available from Cardmaking Online Webshop. I am really getting into stuck into making my Christmas cards as I know that it will be here before we all know it. 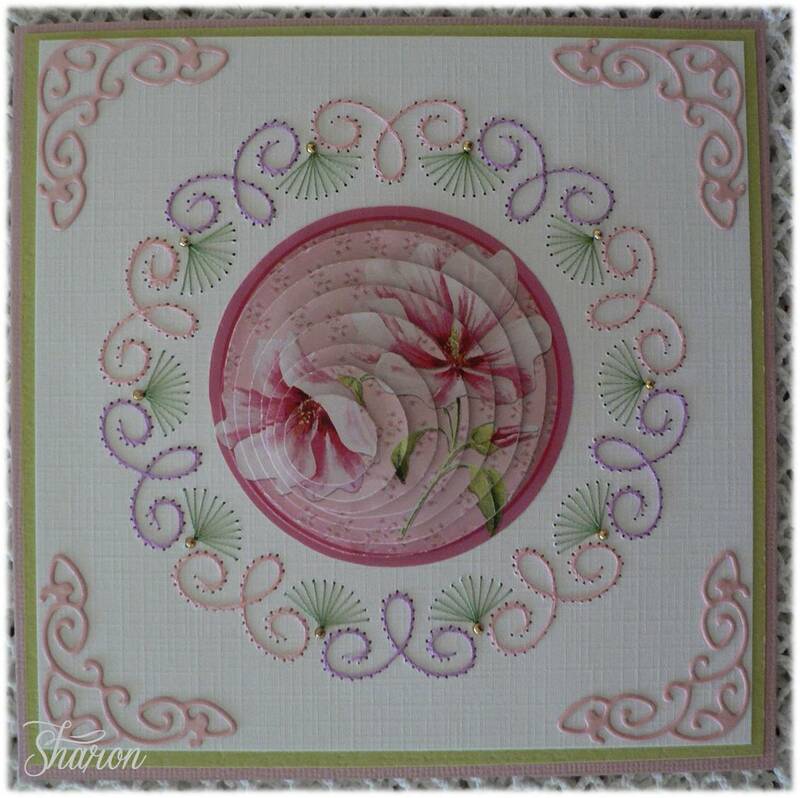 This is another gorgeous pattern from Ann's Paper Art pattern number is a2059 it was also in Hobby Journaal #80. The threads used are Scansilk 1870. Mettler Polysheen 3971, 2830, 3040 and 3211. 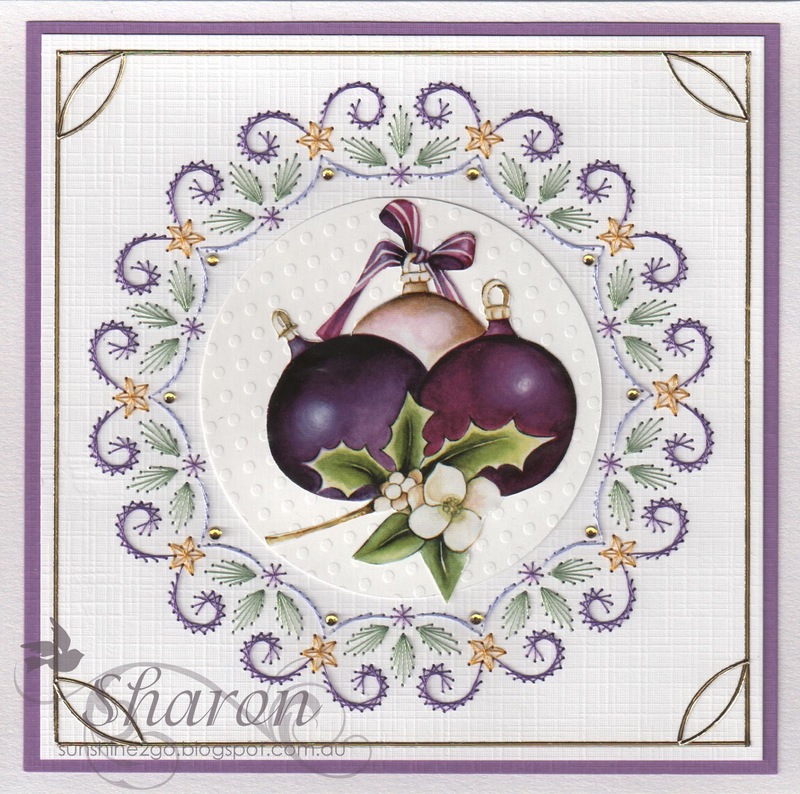 Wekabo have released a lovely set of decoupage for this Christmas, they are all in a Purple theme. I have used 1 from sheet number 831. 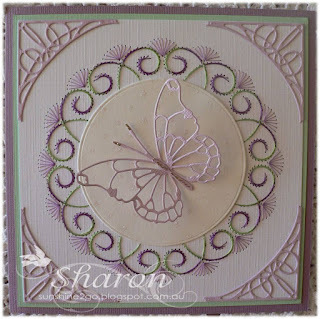 I used a Couture Creation Circle Nesting die in the centre which I lightly chalked around the edges. The corners were cut from Cheery Lynn, Lace Corner Deco J-B175, I think that this die fits perfectly around the pattern. 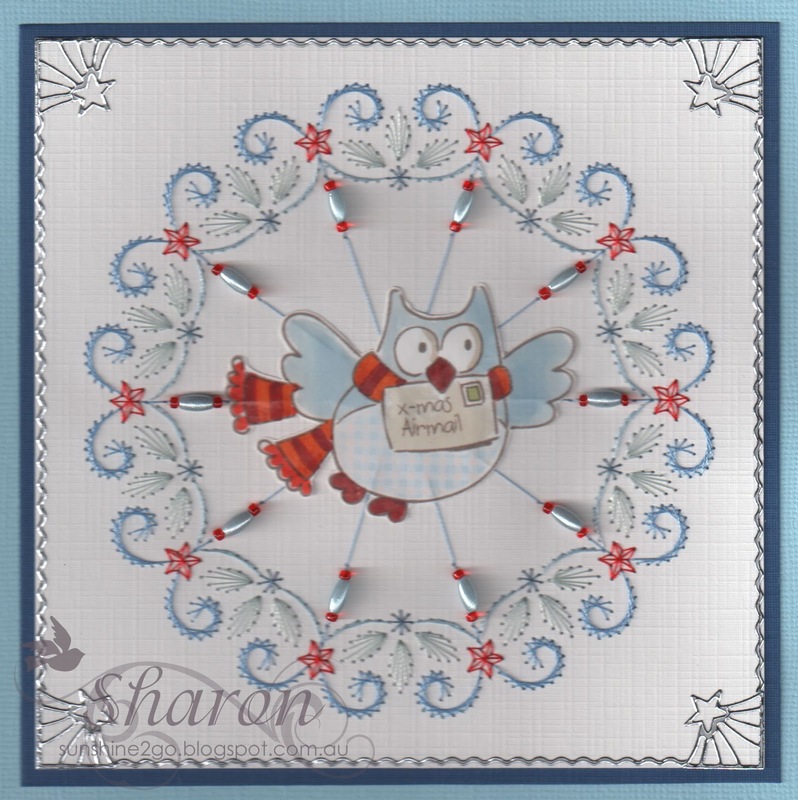 A lovely new pattern from Ann's Paper Art the pattern number is a666 and is available in the webshop now. The threads used are Mettler Polysheen 1903, 5822,5743,0622, 3971. The gorgeous decoupage is a Morehead die cut 11052-352. The Christmas peel off sticker is by Starform 8821. 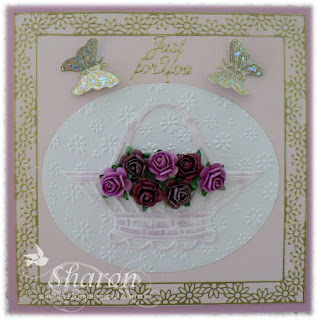 This week at Cardmaking Online I have made a card with a beautiful basket of flowers. The basket is by Marianne Craftable 1280,which has been slightly coloured with Victorian Velvet distress ink. I filled the basket with Marianne Design paper flowers. The basket of flowers has been placed onto the largest oval by Couture Creations which had been embossed in a Daisy embossing folder before die cutting. 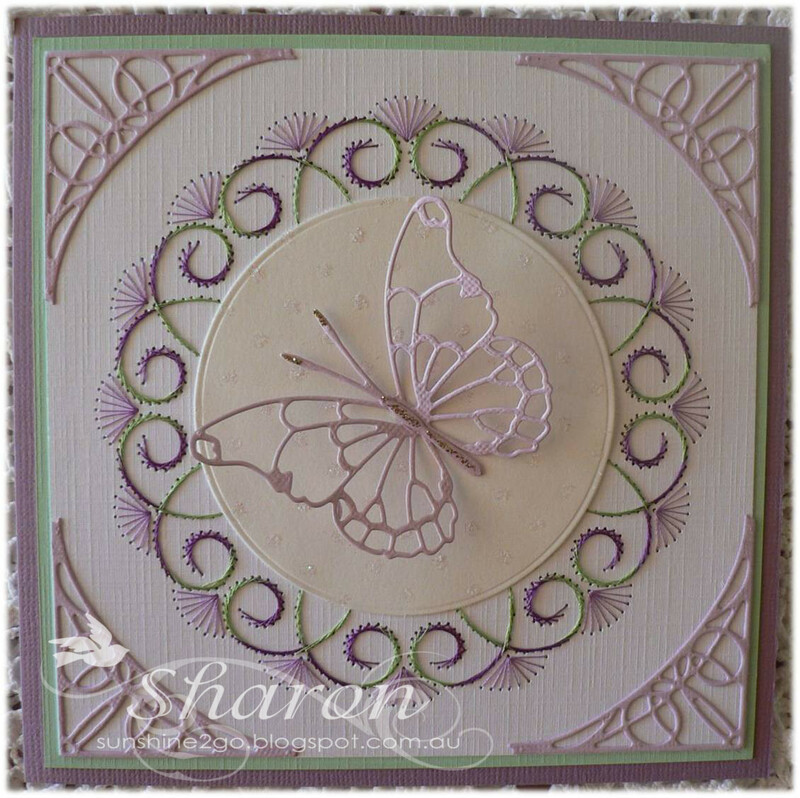 Around the edge of the card I have used a Daisy ribbon sticker and have a attached 2 butterflies and a Just For You, peel off above the basket. 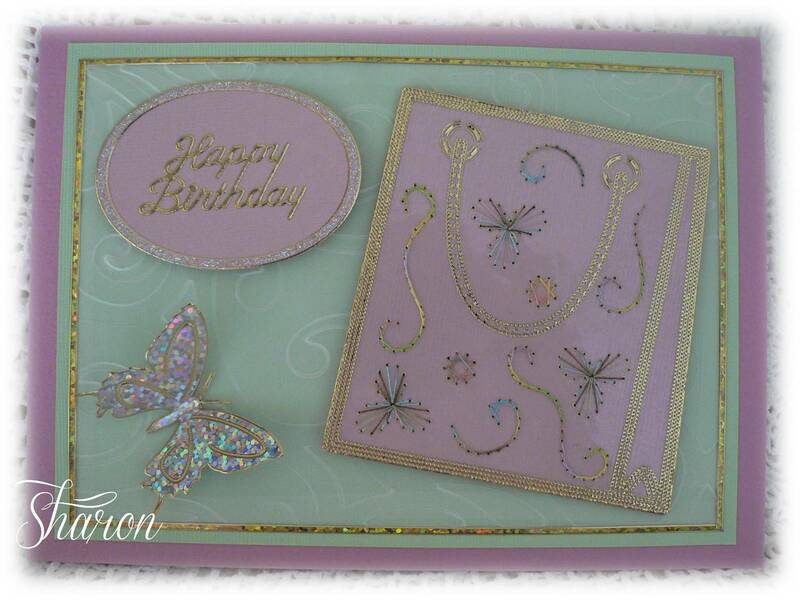 I created this card for a very special young lady by the name of Sophia. The pattern is by Ann's Paper Art number a430-a, I loved stitching this card. The Vievienne butterfly is by Memory Box, along the thorax and the end of the antenna's I have used Stickles. Using Couture Creations Nesting Dies, I die cut a circle from glitter card, which fitted perfectly into the centre of the stitching. 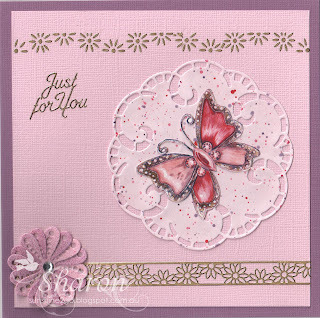 Cherry Lynn, Lace Corner Deco J - B175 have been placed around the edge of the card. Jewels have been added to the centre of the flowers. 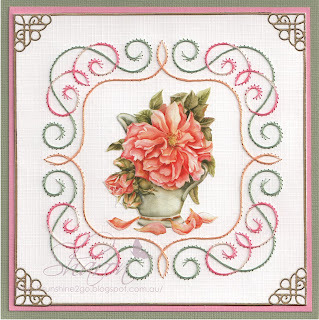 A beautiful new pattern from Ann's Paper Art the pattern number is a644. Now I am really on my way to making my Christmas cards. The threads used are Mettler 7902, Scansilk 4756 and 1842. 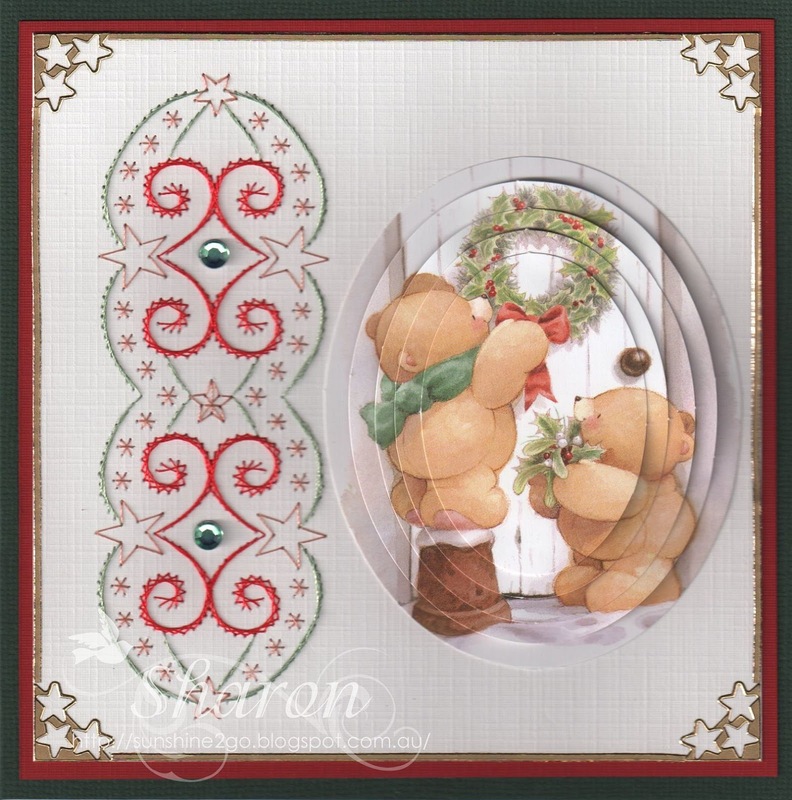 Christmas stickers by Starform 514, have been added to the corners and along the edge. Green jewels have been added in the centre of the stitching. This card is also made from pattern a644 and I have split the pattern in half and decided to do the edges. I hope that you like the end result. 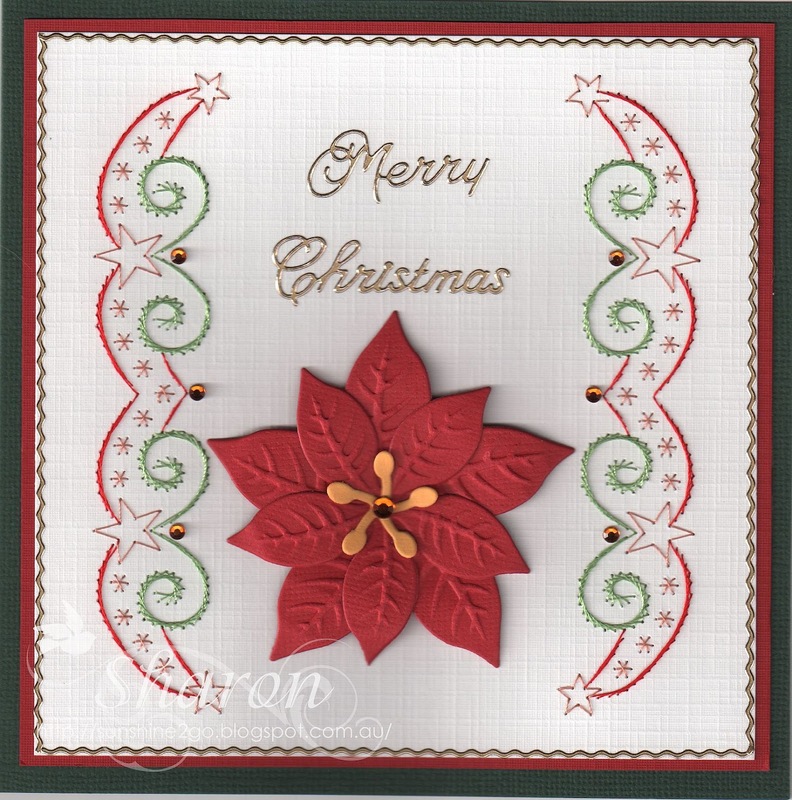 The Poinsettia is Marianne Creatables LRO122. Merry Christmas sticker is by Starform 356. Gold jewels have been added. A beautiful new pattern from Ann's Paper Art the number is a730. I loved stitching my very first Christmas card. 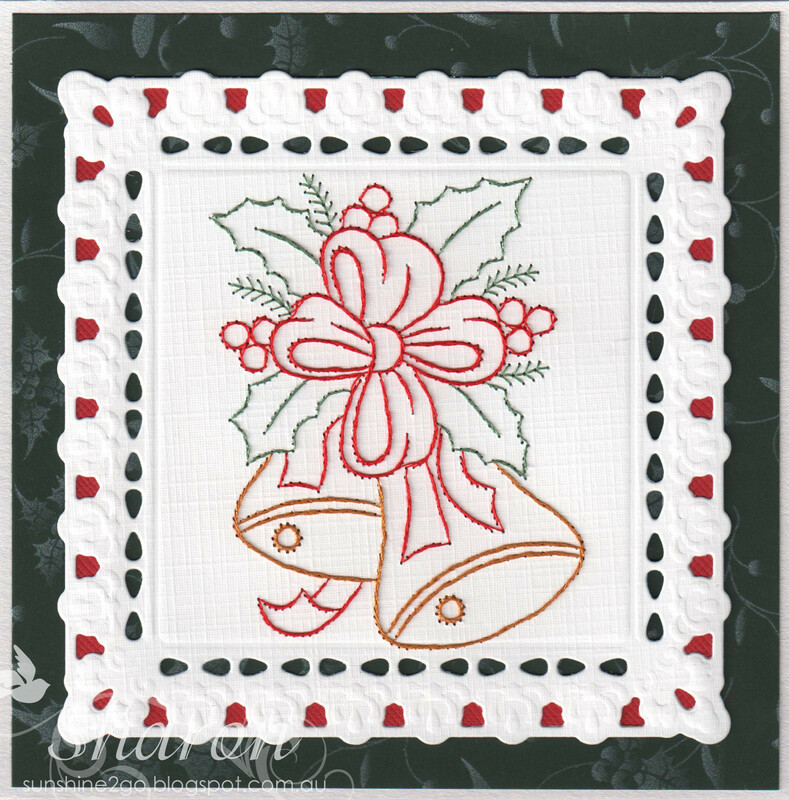 I guess it is time to start making some Christmas cards and Ann's new patterns has inspired me. The threads used are Mettler 2500, Mettler 3950, Mettler 5822 and Scansilk1850. The corners have been punch with the Martha Stewart Poinsettia corner punch. Gold sticker lines have been placed around the edge of the white card. 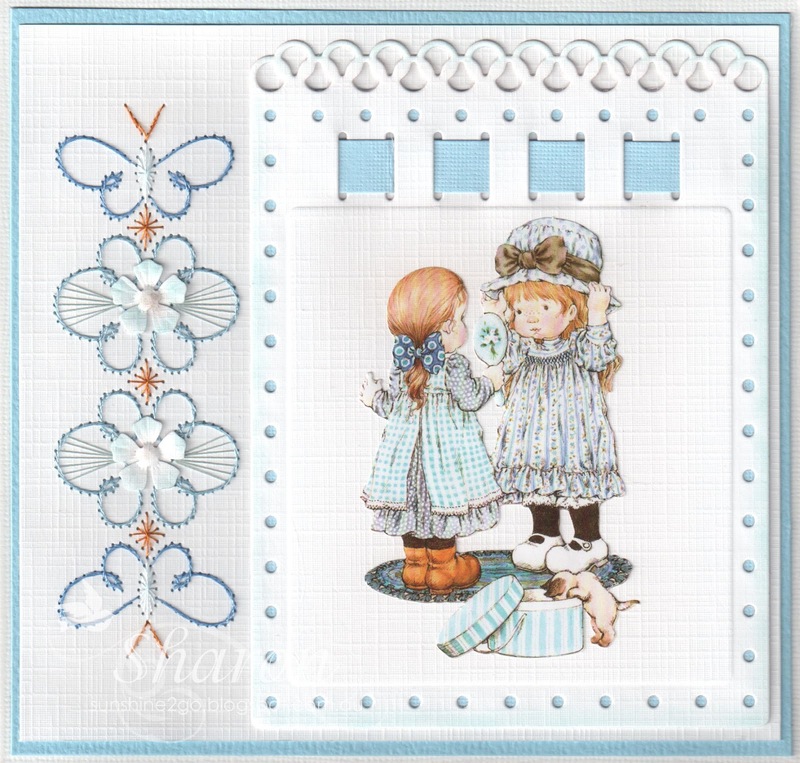 The corner die is by Nellie Snellen and is one of my favourite dies. Rice beads and seed beads have been used in the stitching pattern. 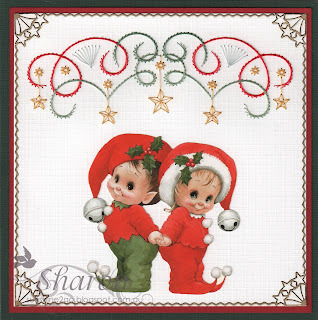 This is a new pattern from Ann's Paper Art the pattern is a662 and is available now in the webshop. The decoupage is by LeSuh, 8215.516 and has 6 sets of beautiful flowers. The peel off stickers is from Starform 1223. 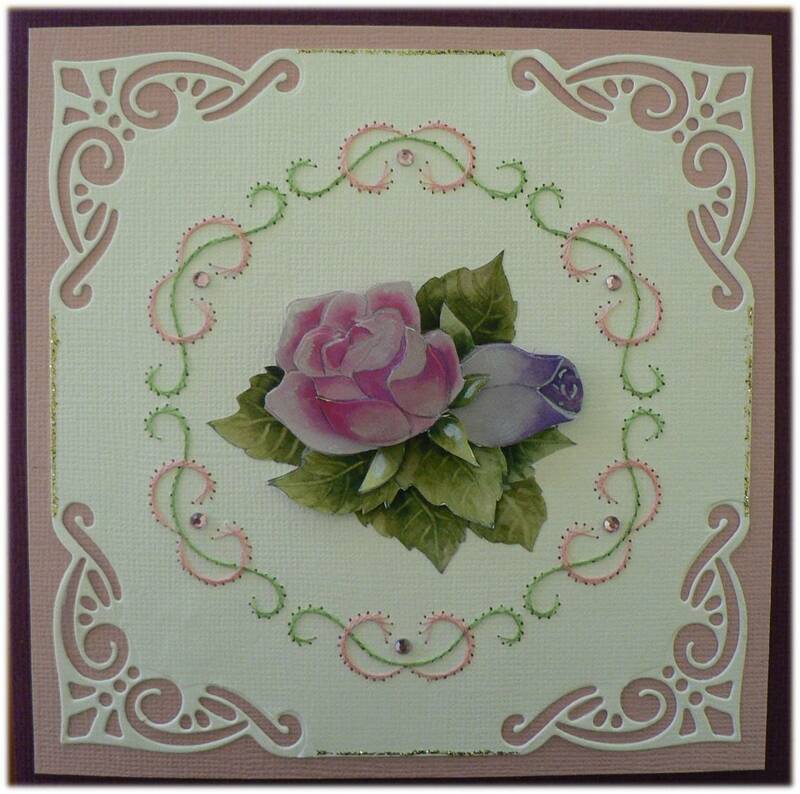 All products are available from Ann's Paper Art. I adore this die, it gives a lovely effect. 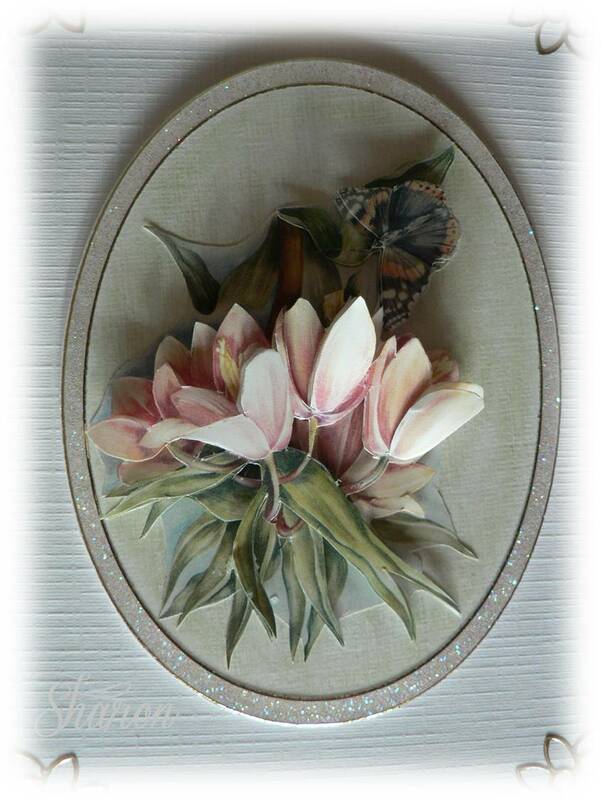 The decoupage is a lovely Prestigious Pearl flower behind the flower I have placed leaves from Marianne Creatables LRO192 which I have added some sparkle to in silver. I bought this gorgeous pattern from Ann's Paper Art and yesterday it arrived in the mail. I was so excited about stitching it, so I started last night. 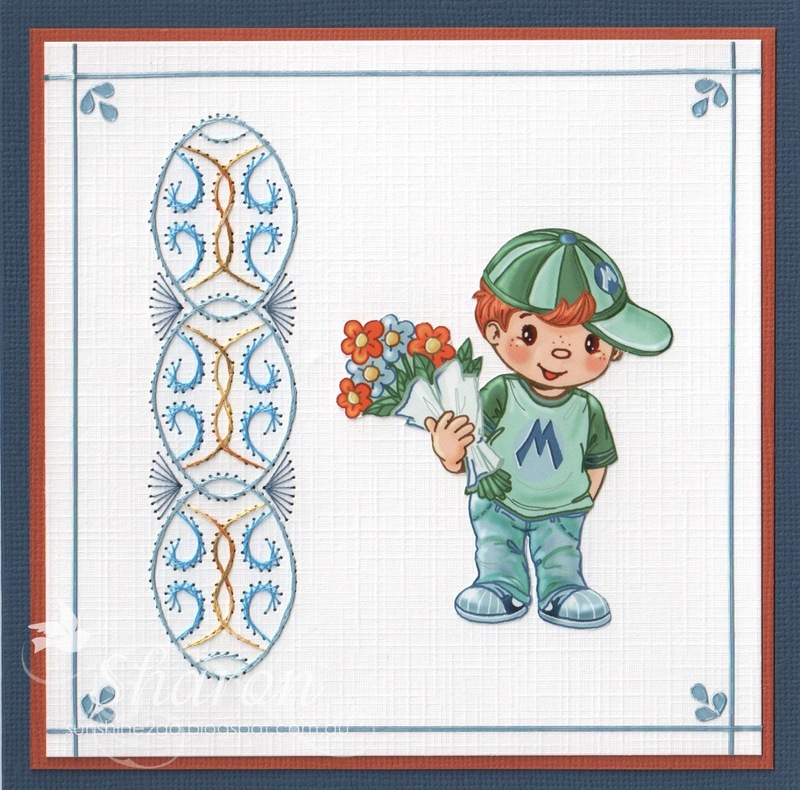 The pattern number is a104 and comes with Crafts-Too die and embossing folder. I thought that the Marianne Creatable LRO140 was perfect for the centre. I have added a few jewels. Papermania Bexley Black paper was used as the background. Gold shimmer card was used for the main card and also for the centre of the die cut, a lighter colour was used in the cut-outs of the die. I made this card for a hobby friends husband. 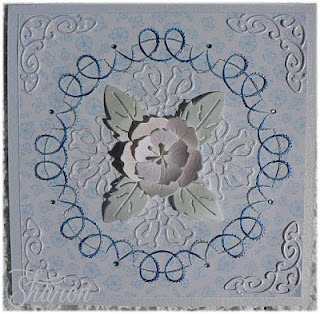 The card that I have stitched is another gorgeous pattern by Ann's Paper Art a399. I have used a combination of Mettler Polysheen 1342, Scansilk Rayon 1857 and Scansilk Rayon 1840 to give the effect of a multi coloured thread. I love doing this, as I am able to make up my own colour combination. The lovely bear is Wellington, which is a embossed sticker. I think that he looks so cute reading the paper. 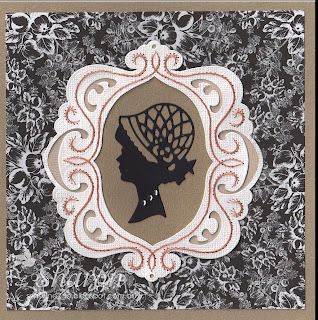 I placed Wellington onto a a circle that I have die cut and embossed using a Couture Creations Nesting Dies. 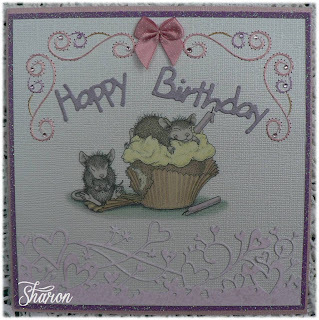 My contribution for Cardmaking Online is this lovely card. 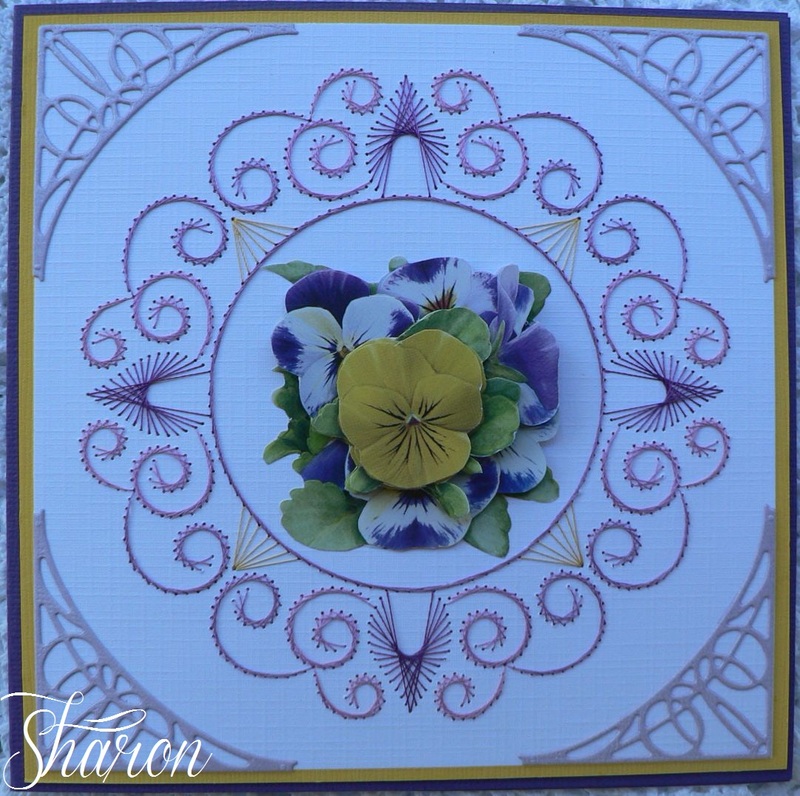 I have used the Marianne Creatable die LRO130 to die cut the centre doily and also die cut the flower twice, I placed a jewel in the centre of the flower. All the die cuts were cut from the butterfly sheet. I have attached a daisy ribbon peel-off sticker along the bottom of the card and have used the negative along the top of the card, so nothing is wasted. A lovely new Lilly pattern from Ann's Paper Art pattern number is a729. When I saw this pattern I knew immediately how I wanted to make this card. Seed beads have been added at the end of the Stamens. Papermania, Capsule Paper Pack, Lincoln Linen. At Cardmaking Online I have completed a tutorial showing you how to use Stitching Stickers and I have demonstrated the stitches used. You can go to the website for all the instructions. I had loads of fun creating both cards. A new pattern from Ann's Paper Art the pattern number is a018. I think it is one that every-one should add to their collection. The stitching has been completed using 2 different coloured threads combining the colours to give a multi thread look. 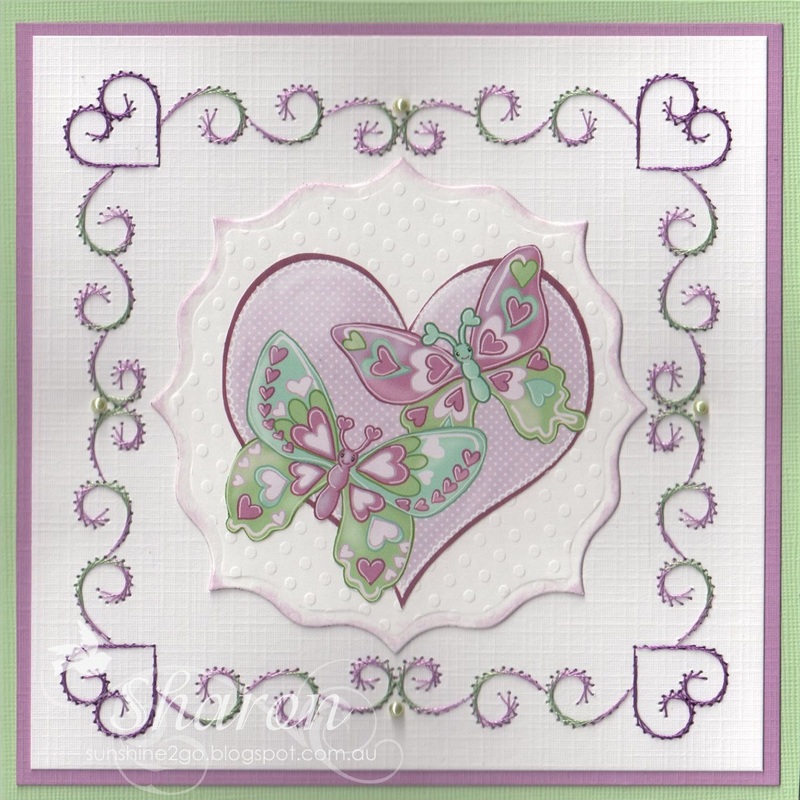 Threads are Mettler Polysheen 2830 (mauve) and 5822 (green) they match the Yvonne Creations ( CD10188) decoupage perfectly. The corner have been stitched using Maderia Rayon 1033. 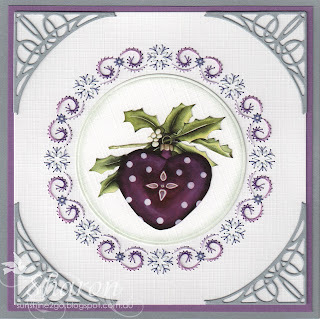 The decoupage is placed onto die cut which I cut out with my Nellie Snellen die MFD010 using Bazzill white dotted cardstock and the Milled Lavender Distress ink has been softly inked on the edges. 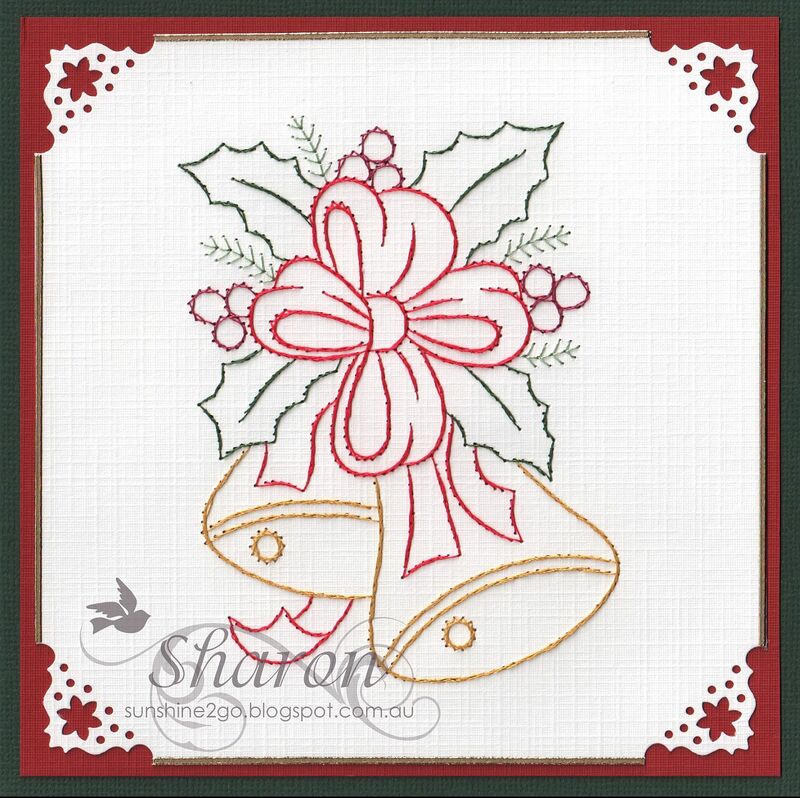 Joy Craft Decorative Pearls 6020/004 have been added around the edge. 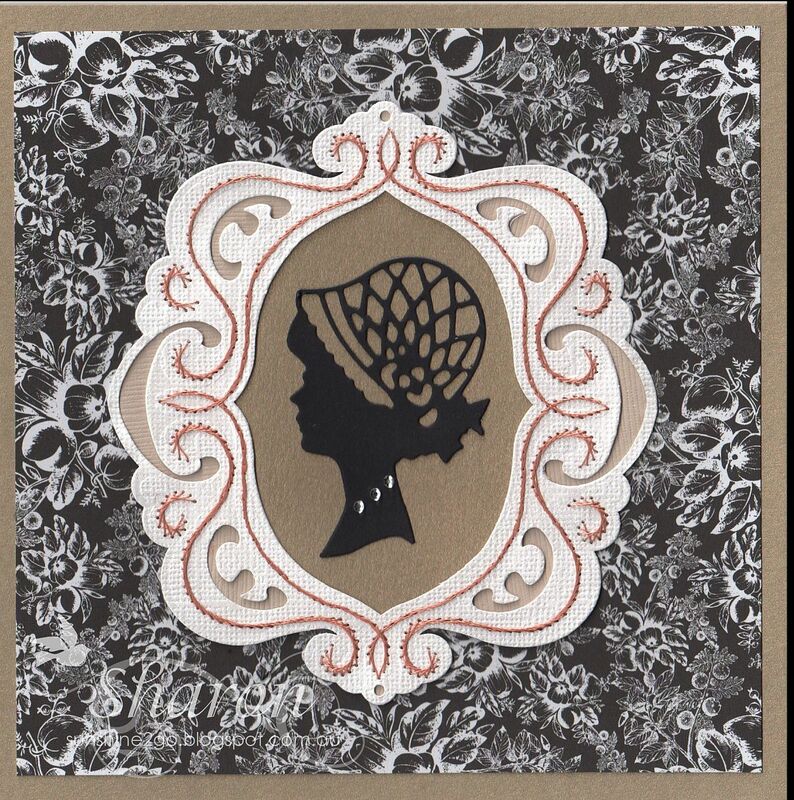 The main cardstock used is Linnenart. I created this gorgeous birthday card for a lovely hobbyfriend by the name of Sylvia, from Ann's Paper Art Forum. 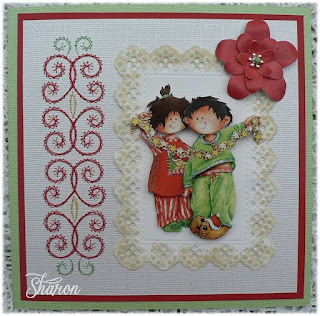 The lovely pattern is from Ann's Paper Art, a474. I am drawn to the circle patterns. 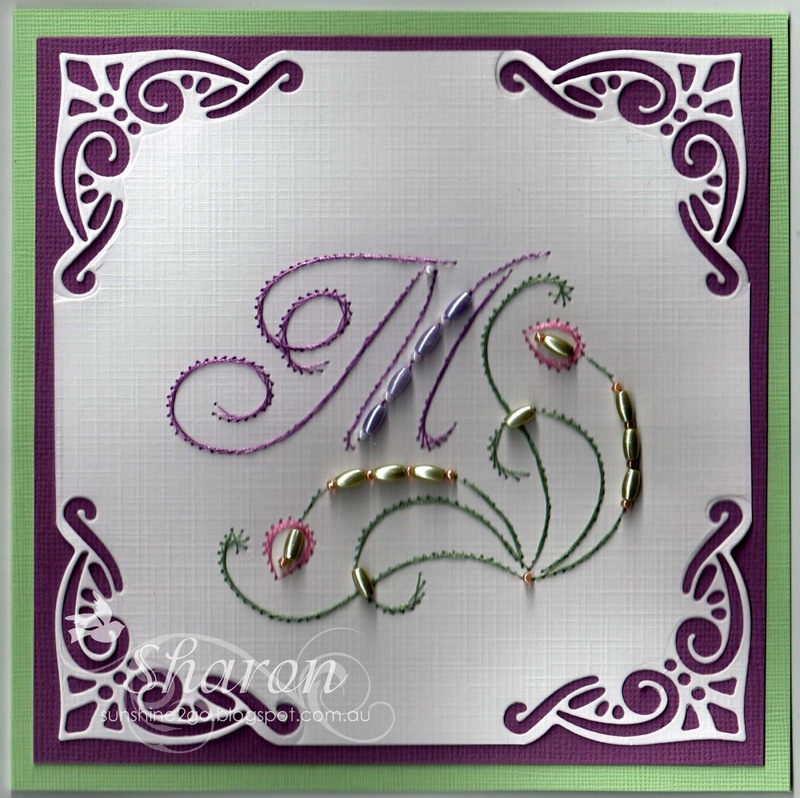 The swirl stitching has been completed in 2 colours, the purple and green have been combined to look like multi threads. Using Couture Creation, Nesting Dies I have cut a circle from glitter card to fit into the centre. The dies have a lovely embossed edge on them. 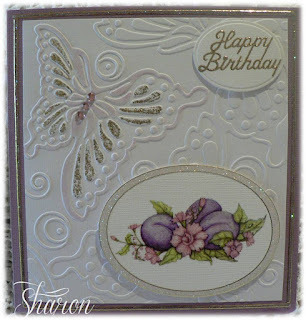 Vivienne Butterfly by Memory Box was placed in the centre on the glitter card, along the thorax and ends of the end of the antenna's I have used Stickles. 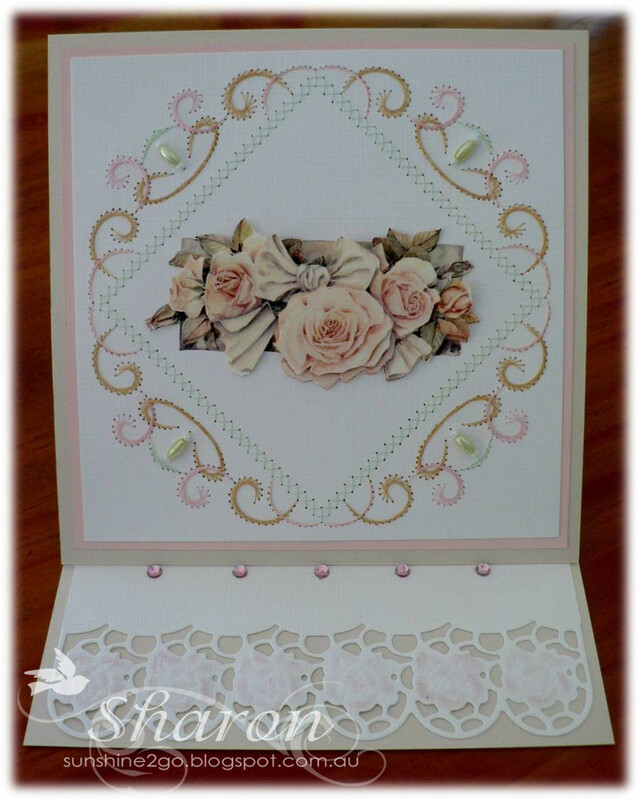 Cherry Lynn Lace Corner Deco J, B175 have been used around the edge of the card. Last week at Cardmaking Online I created a gorgeous card using All Of A Flutter embossing folder to create the base of my card. I have used glamour gold on the inside of the wings and the rest of the small butterfly has been lightly chalked in mauve. Three pink jewels have been added to the butterfly also. I cut out a oval die and placed a Happy Birthday peel off sticker in the centre. 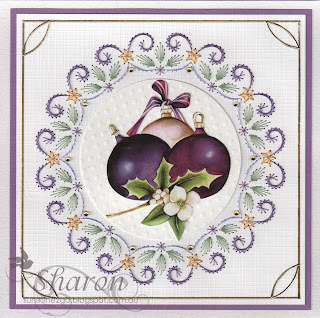 Using a small white card stock I placed a oval glitter sticker on top and using decoupage scissors cut around the outside, I then rubbed on the Joy Plum transfer and attached to the card with small foam squares. Around the outside of the card topper I have placed a peel off sticker. 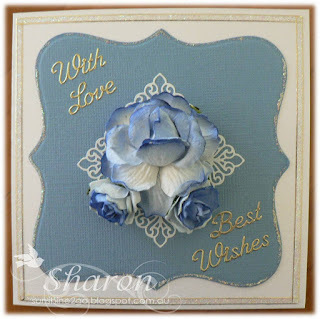 The instructions for this card can be found at Cardmaking Online. I made this lovely Friendship card as part of a lottery game on Ann's Paper Art Forum. 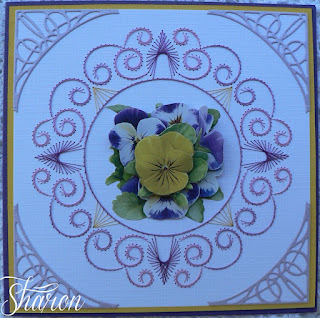 Lucky for me Frances won it and loves purple and Pansies, so the card was perfect. 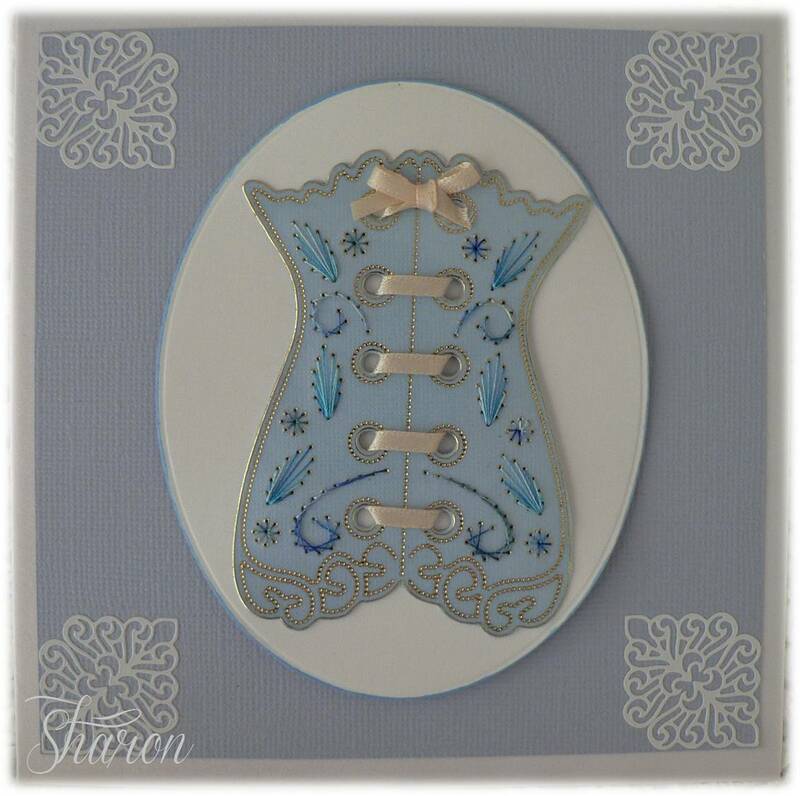 The pattern stitched is a441 and can be bought from Ann's Paper Art. The Pansies are by Le Suh 777.400. 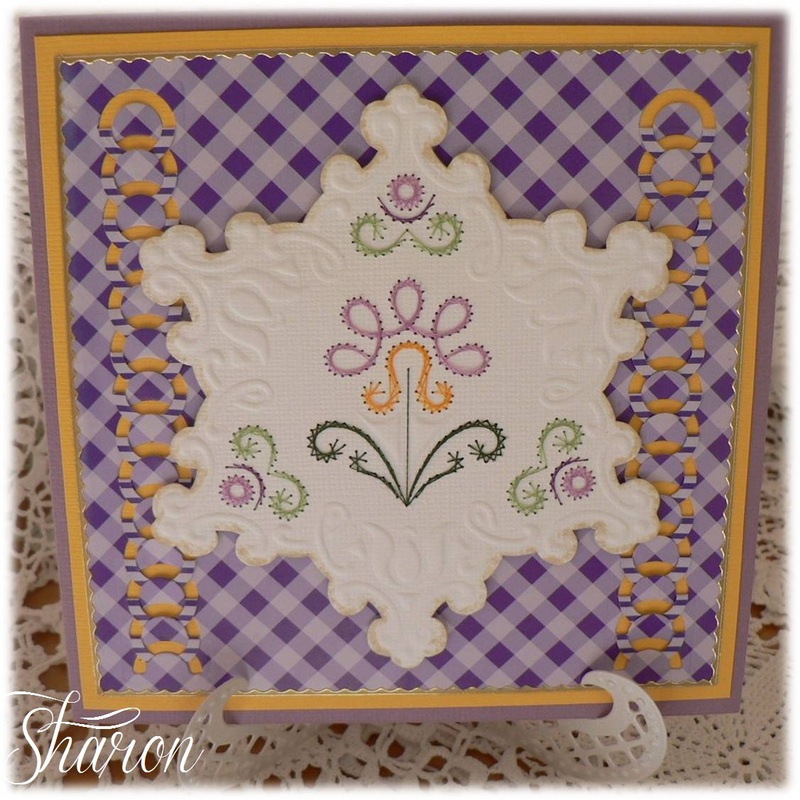 Once again I have used a gorgeous corner die by Cheery Lynn, Lace Corner Deco J, B175. This die is perfect to go around the stitching. 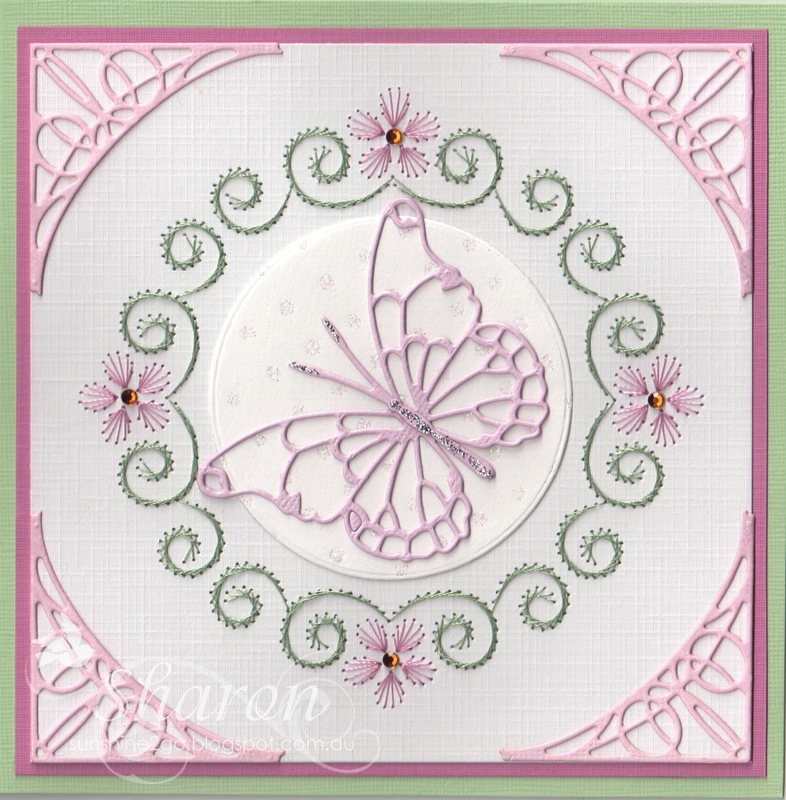 Last week at Cardmaking Online I created a beautiful card using Marianne Design Star Stencil and a Lacé template. The edges have been slightly distressed using Distress inks, before completing the stitching with a lovely selection of threads. I have edged the outside of the Violet Diamond paper with a sticker. The card has been placed onto one of the new Joy stands. 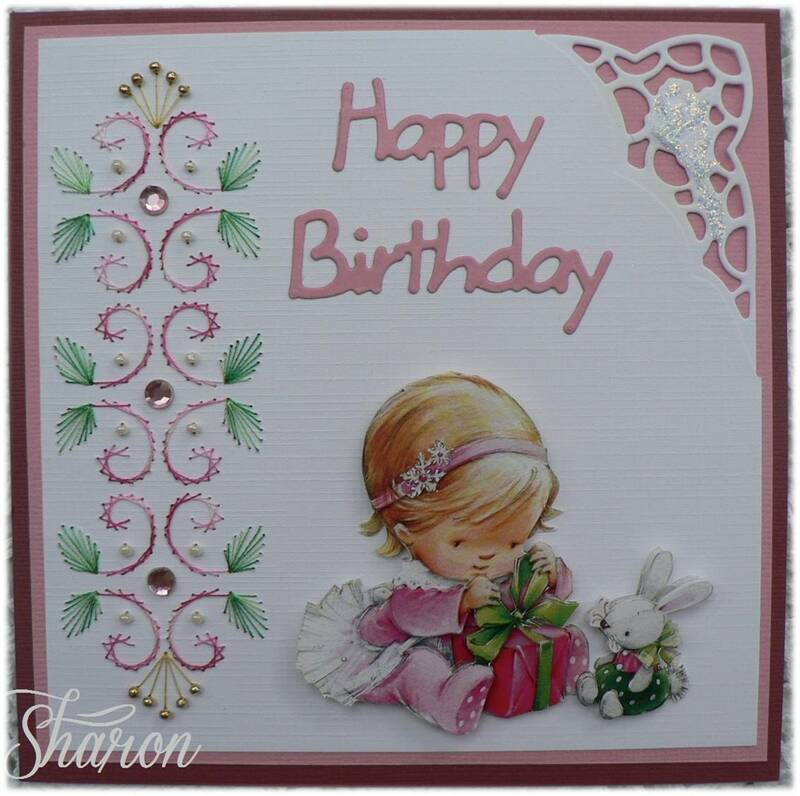 All products can be purchased at Cardmaking Online. 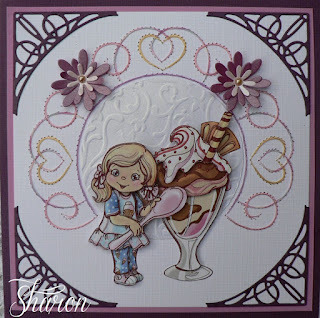 Once again another lovely design from Ann's Paper Art the pattern is a646. Yvonne Creations HJ7051 therefore I left a opening at the bottom. I embossed a piece for the centre and cut with my circle cutter. 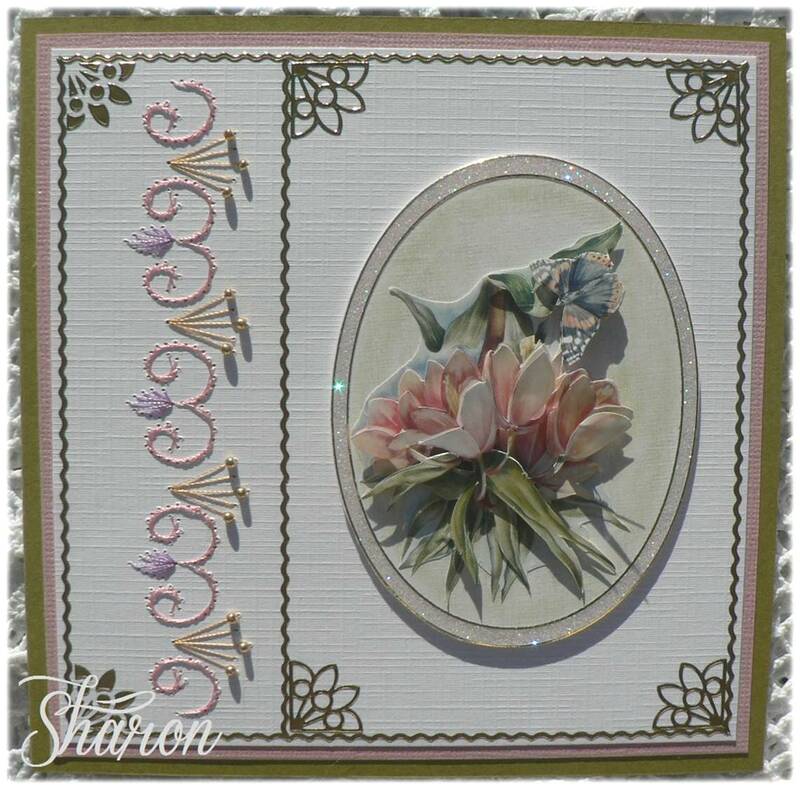 The flowers are from Cherry Lynn, Darling Daisies A196, I added a pearl in the centre of the flowers. The new Cherry Lynn, Lace Corner Deco J, B175, fits perfectly around the page. 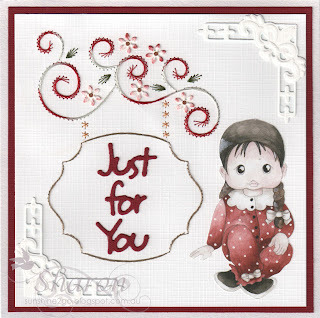 I sent this card to Karin and I am sure that she loved it. 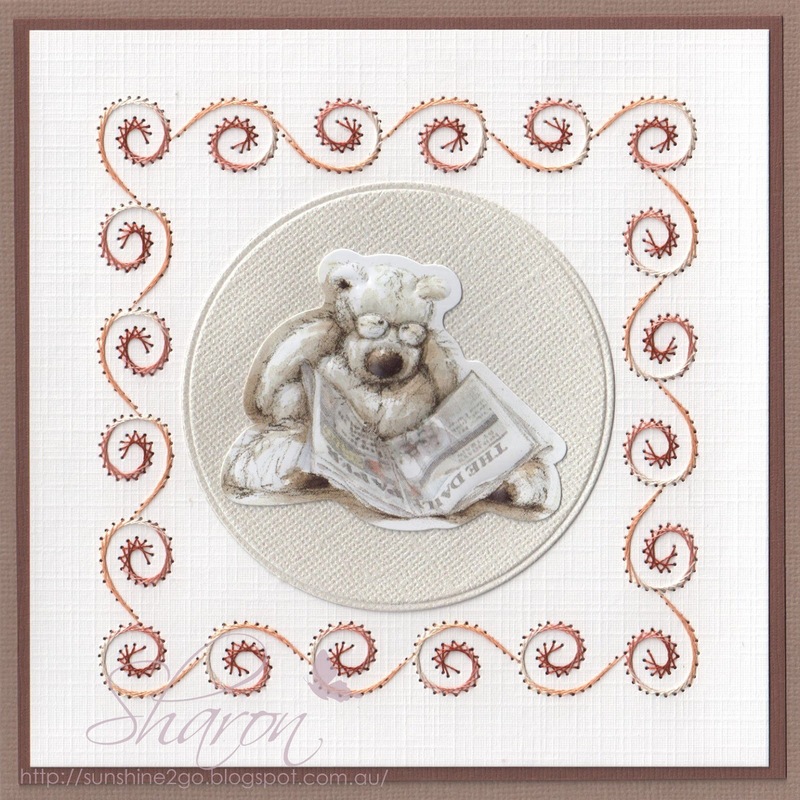 Another gorgeous design from Ann's Paper Art a920 which can be found in the Stitching Sheet book #19. I loved stitching this pattern I just adore the circle patterns they are my favourite. I added little seed beads amongst the stitching. The decoupage is a lovely pyramid by Janneke Brickman JBS158. 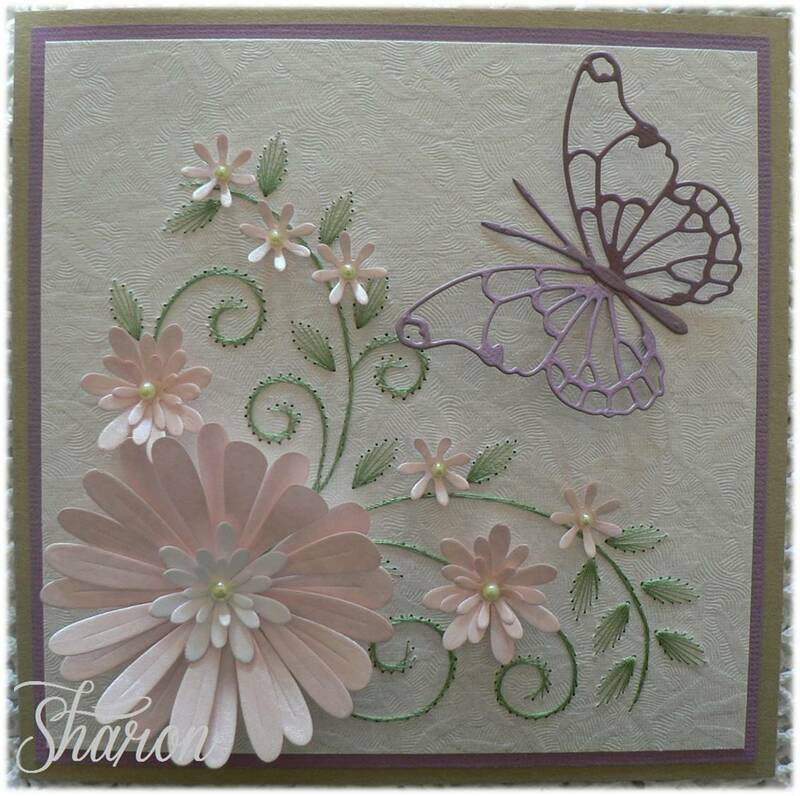 This is another wonderful design from Ann's Paper Art a435. I was asked to create a card in the colours of blue and green. I thought that it fitted in very well with the colour scheme. I then posted this lovely card of to José. but was unaware that I was also going to send it to her. I photocopied the blank card, reduced it by 10%. 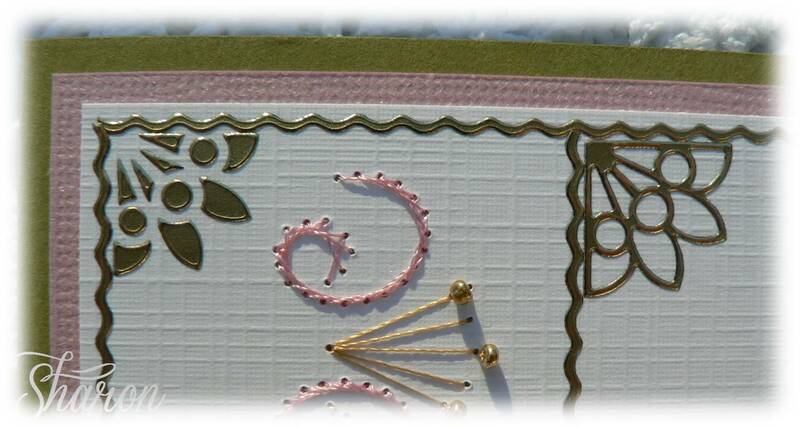 The card has been covered using gold glitter card stock. 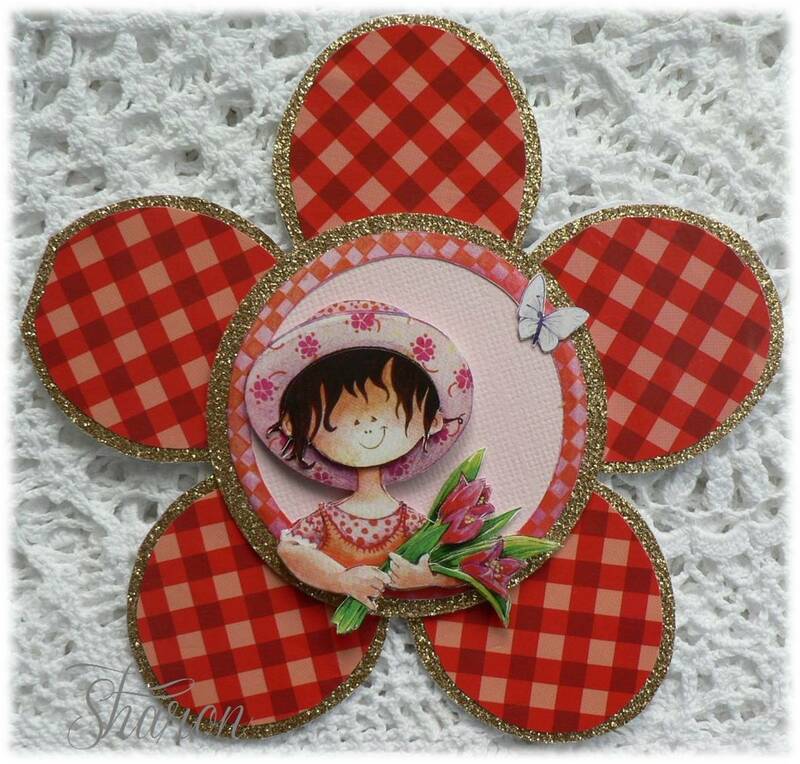 The decoupage is a very cute Snoesjes, I think that they are adorable. A larger circle has been cut also from the gold glitter card stock. Which has then had a pink card place on top. The Snoejes decoupage has then been completed on top, when finished I have attached using foam squares to the centre of the card. 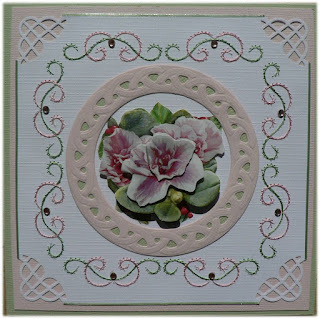 This week at Cardmaking Online I have created 2 cards from Hobbydols 65, these are amazing little books with lot's of inspiration. The cute decoupage is by Femma Design. The Happy Birthday die is by Marianne Creatables LR0223. The lovely corner die is also by Marianne Creatables LR0215, which has had glitter glue added on the embossing. I have stitched using Chrissie Threads, small beads have also been added to the stitching as indicated by the pattern. Small gems have been placed in the centre of the stitching design. 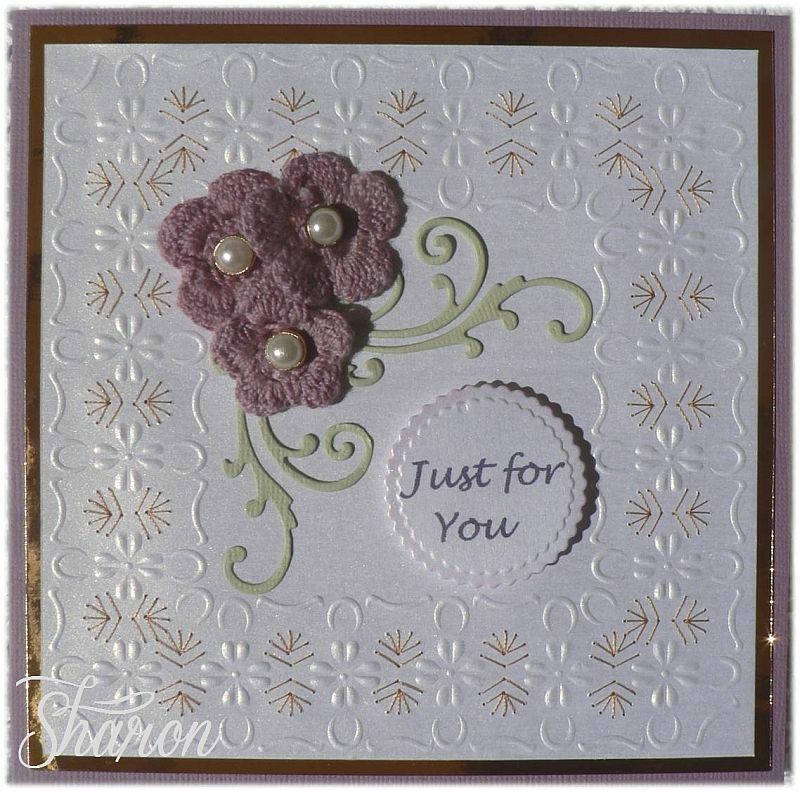 The second card that I have created from Hobbydols 65 is another lovely one. The peel of stickers by Starform 1034 were placed onto the card first. A transfer sheet was used to pick up 2 sets of pieces left behind from the orginal sticker to complete the corner near the stitching. 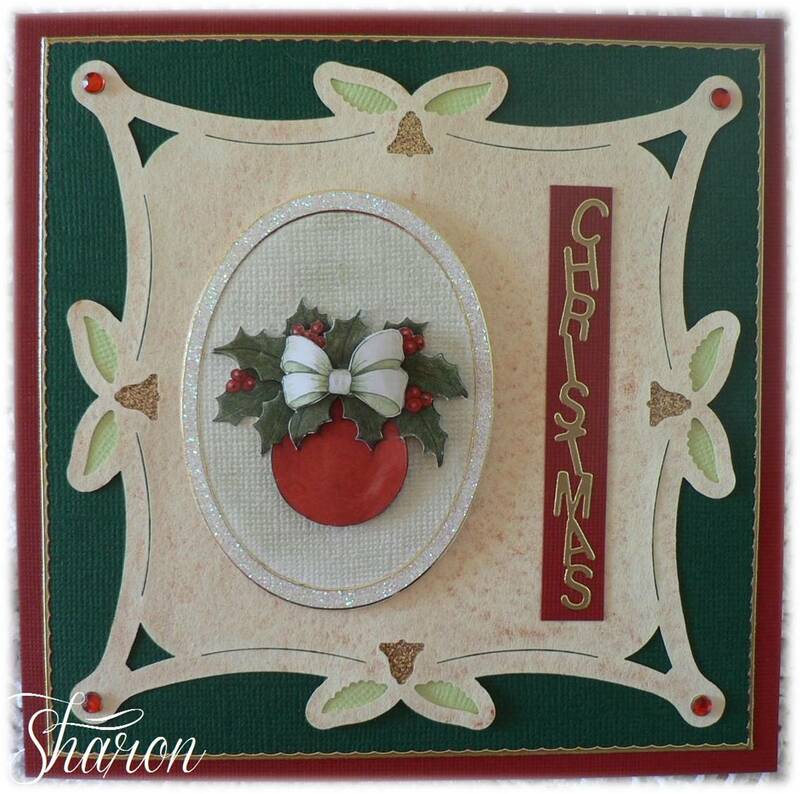 The decoupage is by LeSuh 538 which has been placed on a oval that has been created using a sticker by Starform 1146. I placed the sticker onto card stock then cut out, before placing the decoupage onto the oval which I have coloured using 2 different coloured green chalks, it has given a lovely effect. 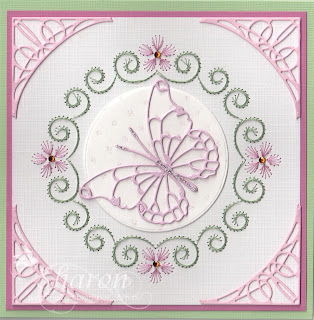 I created this butterfly card for the May competition on Ann's Paper Art Forum. The pattern number is a609 and is available from Ann's Paper Art. Instead of stitching the flowers I decide to use die cut ones. Stacker Flowers #2 and Darling Daisies. 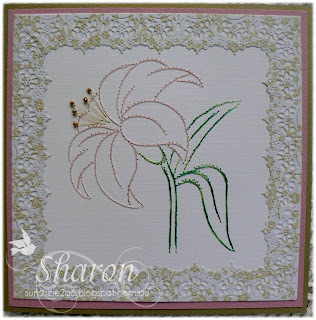 This week at Cardmaking Online I have created a card using the La Fleur Stencil EE3431, I have gone around the complete card with the stencil. The flowers are by Colour Me Crazy, Crochet Doilies which I have mist to add colour as these come in white. Pearl Brads have been added to the centre of the flowers. The swirls are die cut from Marianne Creatable LRO116. The sentiment is computer generated and then die cut, I have chalked around the edge with pink. The topper has been placed on Mirri Card, the main card is Violet. I made this card for a lovely lady in England by the name of Sue (Supernan). 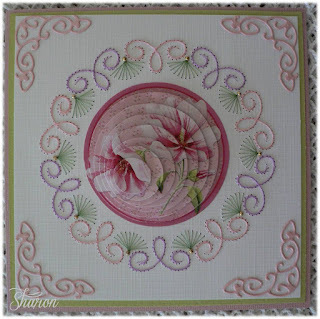 I have stitched another beautiful pattern from Ann's Paper Art a645. The pattern has been stitched directly onto Especially For You paper by Me To You. 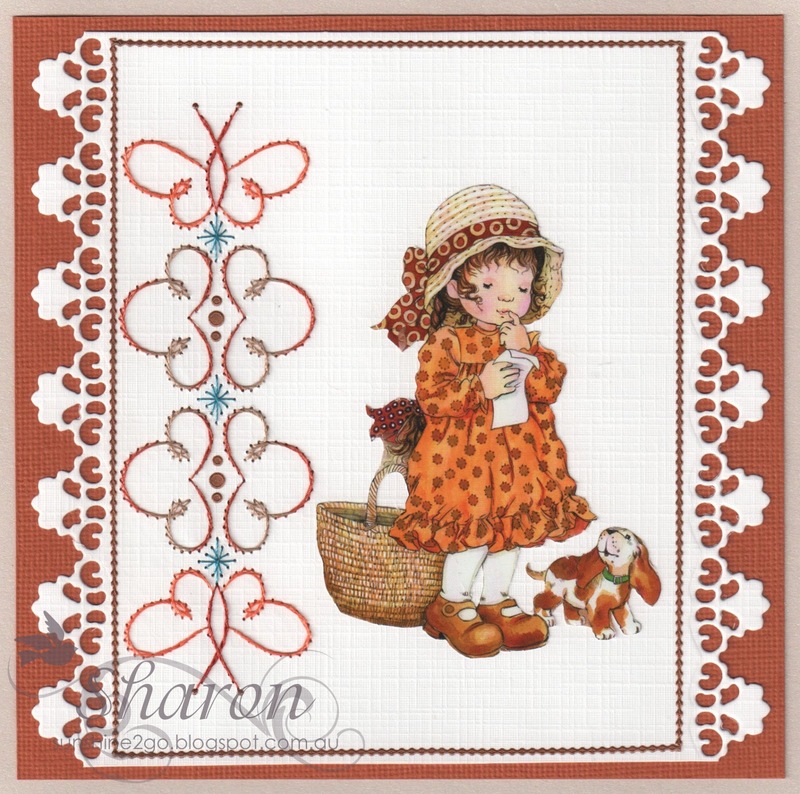 All the dies are by Cheery Lynn Designs, B129, B162, B164, F-1. The flowers and leaves have been chalked. Small gems have been added around the out-side. 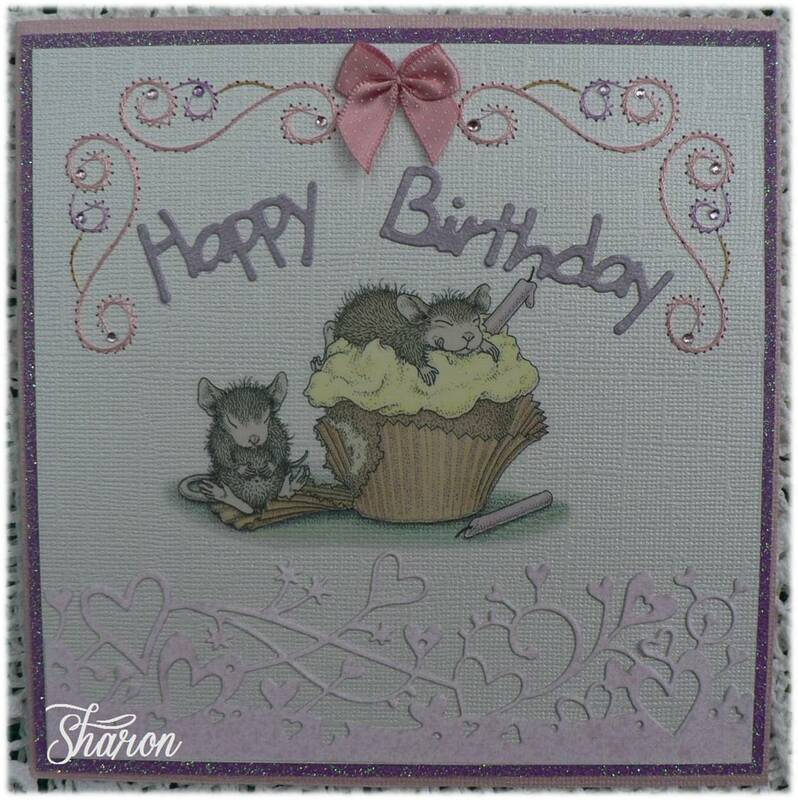 This birthday card was made for my gorgeous daughter she just loves the House Mouse. 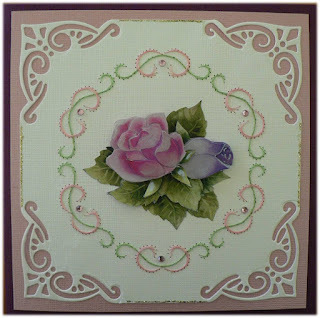 I have once again stitched a beauitiful pattern from Ann's Paper Art a291, I have only used half of the pattern on the card. 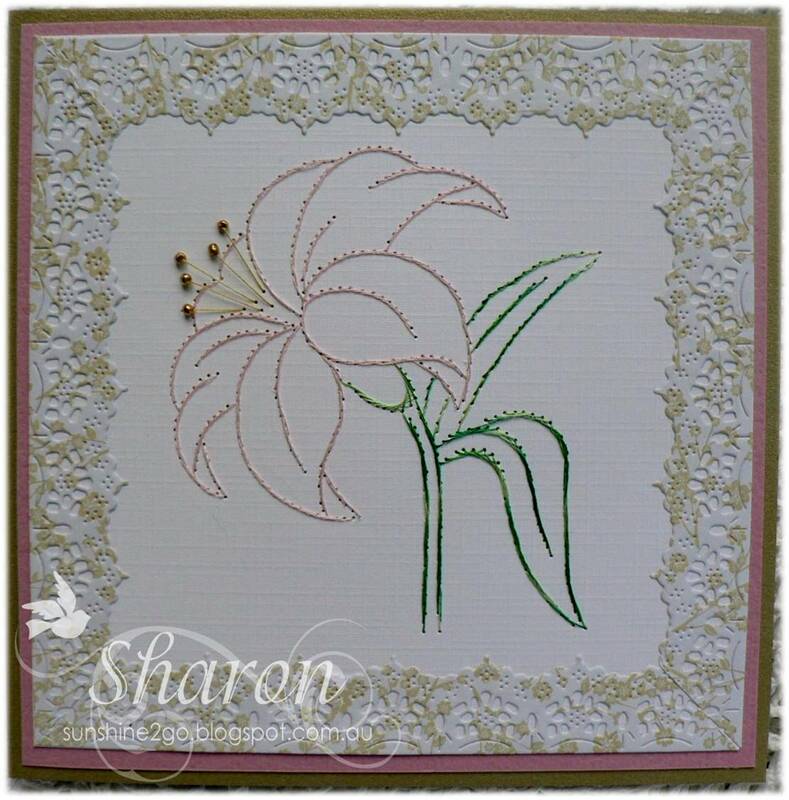 Cherish Border by Memory Box has been used along the bottom which I coloured with Glimmer Mist. Gems and bow have also been added. I made this birthday card for José. I stitched a beautiful pattern from Ann's Paper Art pattern # a291 which can also be found in Stitching Sheets #6. The corners are punched using Martha Stewart, String Lace corner punch. Gems have been added amoungst the stitching and sticker lines along the edge. 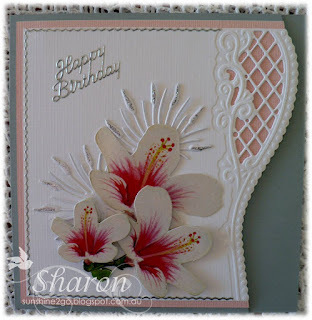 This week at Cardmaking Online I have created a card using a pattern by Ann's Paper Art. The die cut is a Marianne Craftable Rectangle which has been slightly inked using Distress Ink along the edge. The decoupage is a very cute Snoesjes. Marianne Craftable again has been used to make the flower in the corner. All products are available from Cardmaking Online. 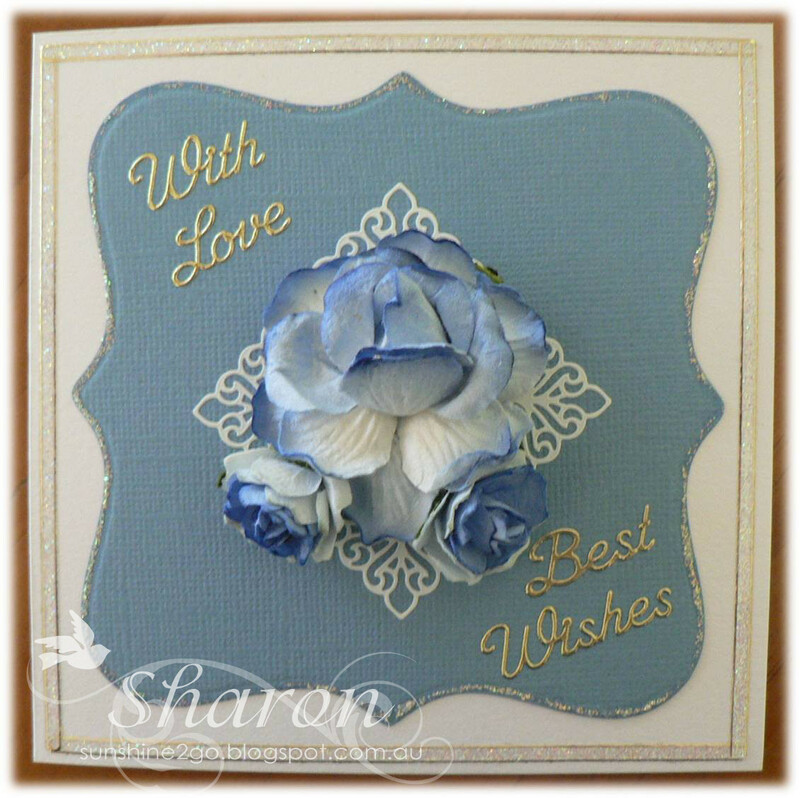 I made this card for a lovely lady by the name of Trish. I stitched a beautiful pattern from Ann's Paper Art the pattern number is a232. 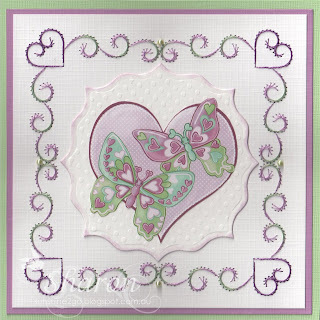 The corners have been die cut using Nellie Snellen MFD027, I just love this die it is very versatile. The gorgeous decoupage is by Marieke Design, Wekabo nr.636. 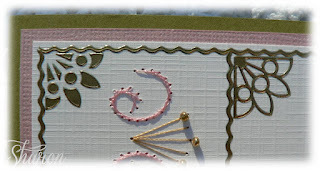 Along the edges I have used stickles gold and I have also added a few gems amongst the stitching to finish the card of. This week at Cardmaking Online I have created a card using a lovely pattern by Karin's Creation KC001. After completing the stitching I have used a Marianne Creatable die LRO131 to create the centre piece. In the centre of the flower I have used a pearl brad and along the edges of the petals I have used Glitter Glue which gives it a lovely effect.